Ok confession, I have a new favorite room in the house and I’m so excited to share it with all of you today! Up until this point, Miss E’s Nursery has been my favorite room, but the Master Bedroom has quickly taken the lead. And rightfully so, everyone needs a master bedroom retreat, right? As many of you know, I’m all about frugal decorating and keeping costs down to a minimum and this room was no exception. 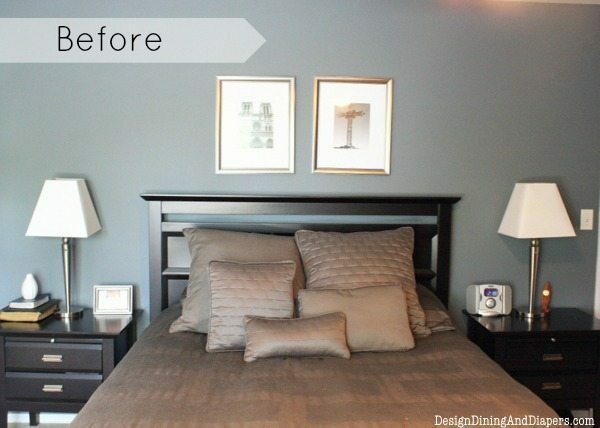 So this is a true Master Bedroom Makeover On A Budget. By having a clear idea of what I wanted, recycling pieces I already owned and doing some thrifty shopping, I only spent about $175 on this makeover. Note, the entire room isn’t finished yet so that includes what you are seeing today. You’ll also notice that the room is a little more ‘glam’ than any other room in our house. I went a little more Mid Century Modern than I originally planned and definitely stepped out of my comfort zone, but I have to admit I absolutely love it. My goal was to give this space a big facelift. I wanted to brighten the space and make it a little more modern and a little more me. I was originally worried about keeping the dark furniture, but by lightening the walls, adding more white and completely changing the design, I now see this furniture in an entirely different way. I actually like it again! For the walls, I chose Cosmopolitan by Benjamin Moore Color Stories. I am in love with how the gray wall color turned out. In the day light it has a little more tan hue to it, but in the evenings and at night it is the perfect color of gray. Then, I used white acrylic Paint by DecoArt paired with the Fuji All-Over Stencils by Cutting Edge Stencil to create the wall pattern. This was my first time doing a large stencil project and I love how it brings a whole new dimension to the room. I have to admit, it wasn’t an easy breezy project but it was worth it in the end. For the longest time I have been swooning over the vintage brass pharmacy lamps. But their price tags can run up to $300 which is not even near my budget. I ended up finding these lamps at IKEA for $30 a piece and I spray painted them gold. Major score in my book. I also gave the furniture a little face lift by spray painting the hardware the same gold used throughout the room. I can’t believe how different the whole set looks in this space and with the new gold accents. Just shows how anything is possible. I just HAD to have a deer silhouette in this space. I have been wanting one forever and this was the perfect time to make my purchase. This little guy came from Z-Gallery and only cost me $50 (which is actually a big purchase for me!). I found the frames on sale at Ben Franklin Craft Store and gave them a coat of spray paint to achieve the look I wanted. I paid $45 for all three. I was hoping to find them at the Goodwill for less, but I couldn’t pass these up since they were exactly what I wanted. All of the bedding was found in our guest room. Since the room is rarely used, I didn’t mind ‘borrowing’ it for our new space and the best part is I didn’t have to pay a dime. I made the pillow using an old pillow case, blue painter’s tape and some good ole’ spray paint. I think it makes the perfect little accent pillow against the black and white pillows. Almost all of the accents found in this space were repurposed from things I already had around the house and given a coat of spray. And if you missed my Inspiration Post, here is what the room looked like before. You can view inspiration for this room here, and more on my Pinterest Board. 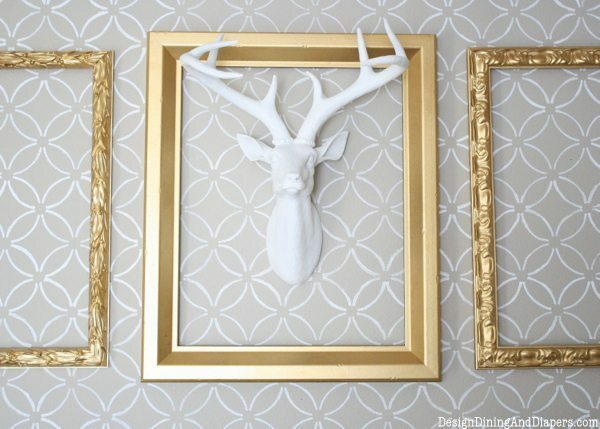 I used the Fuji All-Over Stencil by Cutting Edge Stencils to create the wall pattern. This was my first time doing a large stencil project and I love how it brings a whole new dimension to the room. I have to admit, it wasn’t an easy breezy project but it was worth it in the end. One thing I quickly learned was that acrylic paint works much better than latex paint for the stencil. It goes on much smoother and doesn’t bleed as much. With that said, as much as I love how the stencil looks, I had to do a lot of hand touch-ups. Here is my tip, stenciling takes a lot of time so don’t expect to be done in one nap time! If you are thinking about starting a stenciling project, you can view a great tutorial here. Just plan for it to take you a few days. For the walls, I chose Cosmopolitan by Benjamin Moore Color Stories. I am in love with how the gray wall color turned out. In the day light it has a little more tan hue to it, but in the evenings and at night it is the perfect color of gray.The Color Stories shades are all made in their premium Aura paint and it doesn’t disappoint. While it will run you about $65 a gallon, it is worth every penny. I painted the light gray directly over a dark blue wall and it was completely covered in one coat. Yes, one coat. I did a very light second coat for a few touch-ups but that’s it. I was extremely impressed with the quality of the paint and I will probably be going back to it for future projects. Everything else I repurposed from around the house or the previous room and a big thank you to Cutting Edge Stencil for providing the stencil for this project and to Benjamin Moore for providing the beautiful paint color. It looks so great, Taryn! I’ve been wanting to make some little updates to our master and I’m loving what the the simple hardware update did to refresh your furniture. Great idea! This is so amazing!! Love that deer head…really love that!! LOVE it Taryn! The color scheme is perfect. And I want those lamps!! Oh my gosh, I LOVE IT!! We just moved into a new house and are changing the master wall color to gray. I am def going to be using your new room for inspiration! What a BEAUTIFUL job, Taryn!!! That stenciled wall is amazing! love it all! Wow Taryn that wall must of taken quite awhile to do?! It was well worth it! its gorgeous!! 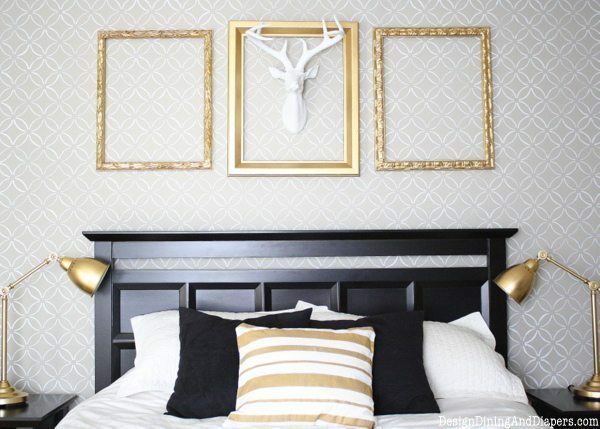 LOVE the wall stencil with the gold! Good job! Great job Taryn! I love the stenciling. This is so beautiful! 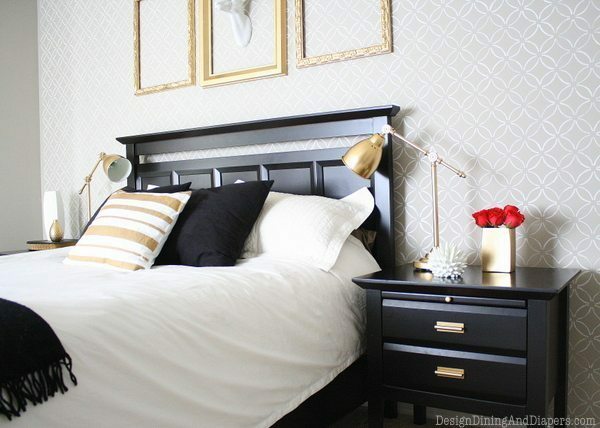 I love all of the gold accents and what a great idea with the spray painted pillow! You are so thrifty and have beautiful taste, I love it! What a fantastic transformation! I’m loving the stenciled wall behind the bed… gives me some great inspiration to work on our bedroom! What a glam new room, I love it! I give you credit to have the patience to do all of that stenciling. 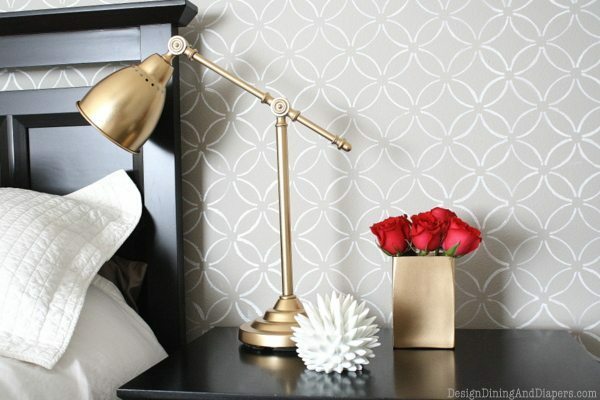 I just love it all … the stencils, the gold spray painted everything (even the pillow!). And those lamps just make me smile. They have so much personality, right? Does that make sense? I adore them though! What an amazing makeover!! It really does look beautiful! I love the stencilled wall, and the black furniture looks great against it! Wow that’s a fantastic makeover on a budget too! Loving the brass/gold highlights teamed with the blacks and greys. Beautiful job…and on a budget. Wowzer!!! Killer bang for so little buck! It look amazing, and I’m really digging the brass accents :) Stopping by from the Delightful Order link party! It is so elegant! I love the wall treatment. Nicely done! it looks amazing!! I am in the process of brainstorming how to update our bedroom – and I really love this! Taryn, I am completely impressed with your stenciling job. Way to go! It’s just beautiful! You must be so proud. 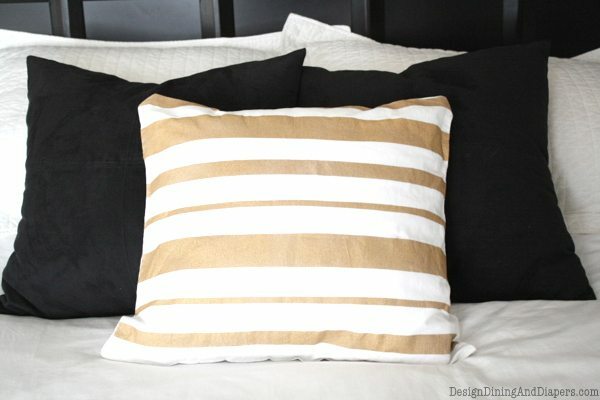 And I love the look you were able to achieve with a can of gold spray paint, including the striped pillow. You’re very resourceful! Can’t wait to see what you do next. Have a great day! Love everything you did with the room. 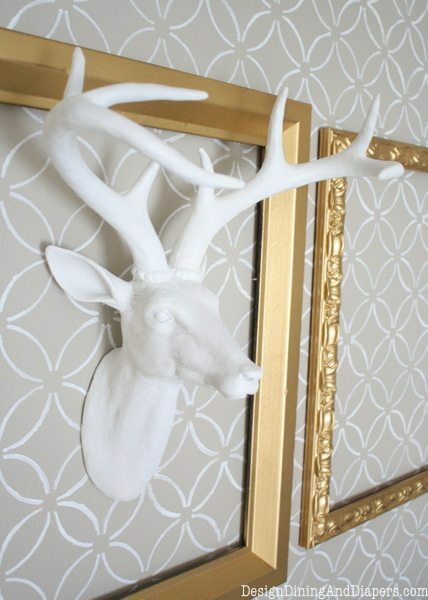 That wall had to be a labor of love AND I’m a bit obsessed with antlers and deer heads now so I am swooning over yours. The makeover on the lamps was genius. Like I said I LOVE everything you did! Your before and after is such a huge difference and I love how you accomplished it without changing the furniture. My favorites are the stencil and the lamps! oh Taryn, it looks great! I was thinking as I saw the first picture…”I love those lamps…I wonder where she got them” ….I’ve seen the ones at Ikea and knew they didn’t come in gold but for some reason I have a brain block when it comes to spray painting…i always forget it’s an option! lol. anyways..amazing! So beautiful! I just love the little lamps from Ikea….they look way more glam than I would ever give Ikea credit for. The power of spray paint! Love this!! I wish I was as brave! I found your blog through the Benjamin Moore facebook post and wanted to say that I LOVE your room! I’m a sucker for anything gold, so obviously the lamps and frames struck a chord, but when I read that wall pattern was stencilled… by hand!… I was blow away. Amazing job. Can’t wait to check out the rest of your blog! I love the room! That stencil is my favorite and that gray color looks great! Gray is such a hard color to get right. Wow! Your talent for putting something like this together on a budget blows me away! I’m not usually a gold lover, but this is AWESOME! I absolutely love this makeover. LOVE. I have come back to this post like 5x just to look at your room again. Great job with all the little details. I absolutely love how that wall turned out! Beautiful!! I love love love how it turned out! Wow! The master bedroom looks fantastic and I love the paint color. Gotta love Benjamin Moore, they’re the only paint I use. A little costly but so worth it…looks amazing! Wow! What a transformation. The room looks amazing. I especially like the stenciled wall. I love the stenciled wall! Looks great :) I haven’t done a stenciling project but I”m guessing this took you forever! I am so impressed with all your rooms you’ve shared on your blog! Yours is always one of my faves to read! Shut the front door – that is gorgeous! What a gorgeous transformation – and I can’t tell you how impressed I am with your stencilled wall!!! And I’ve really fallen in love with gold again – so your accent colors melt my heart! Spray paint pillow!? Brilliant! I will have to try that. And I love the lamps, too. Truly attention to details pays off! I love the gray walls with the stenciling most of all. I think if they had stayed plain gray, the look would have been more muted. The white helps lighten the room up. I would love for you to link your post up to Frugal Thursday Rewind! Very pretty! I love how the stenciled wall adds so much depth to the room and the gold accents really tie everything together. A wonderful transformation! Love that you added gold to the palette! Beautiful! 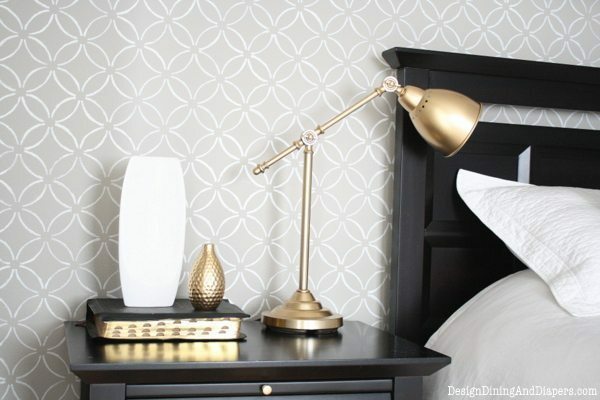 The new wall color, the stenciling, and the gold accents give the room a sophisticated look! I love it! It’s absolutely beautiful! I love the gray and gold together. And the framed deer, so cute! 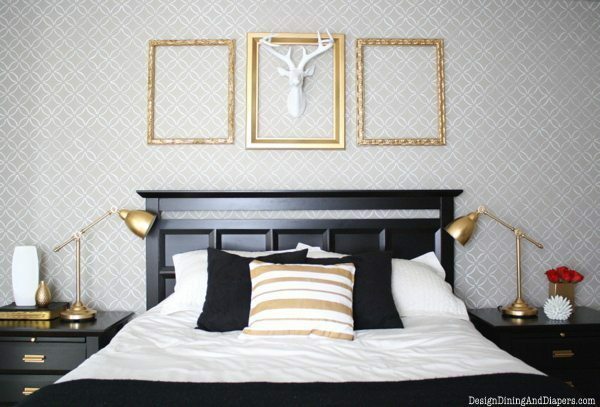 I love the gold frames and the stenciled wall! It looks great! Absolutely gorgeous! I love all the gold accents! Love this, thanks for sharing! It’s amazing what a little gold spray paint can do isn’t it :) I’m your newest subscriber by the way, can’t wait to see more!! I love your new master bedroom. That wall color is divine! Can’t wait to see the rest. love the gold spray painted items. can you share which brand you used and what shade? Love the makeover. Will definitely have to do the pillow thing. Thanks for sharing. You really inspired me. This is so inspirational ..i will be getting married soon and will have my first home with my soon to be husband..We don’t have a big budget especially with all the expenses that will go in to the wedding…Your blog is teaching me the value of creativity and hard work and I love what its taught me. I can;t wait to take your tips and tricks from the your blog and apply them my fiancé and I are so excited! It turned out so great! I love it. I love those lamps from Ikea, and they look amazing in gold! I love this idea! Can you tell me what size frames you used and the color/brand of gold spray paint?